Verken de hoogtepunten van twee van de meest beroemde steden van Toscane, Florence en Pisa, op deze kleine dagtrip vanuit Rome. 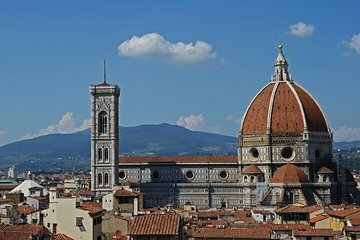 Wandel door het historische centrum van Florence om de prachtige koepel van Brunelleschi over de kathedraal te zien. Bewonder de scheve toren van Pisa, een van de bekendste monumenten van Italië. The trip to Florence was about 3 hours one way. Our family of five got picked up from where we were staying in on time. Our driver, Boris, was friendly and polite. Beware if you get dizzy easily - I suggest bringing motion sickness medicine along with for the trip to and from Florence. It was a bit disorganized as we were off schedule due to difficulty finding parking in Florence. We arrived in Florence and he gave us a small tour, but followed us around while on his cellphone the whole time. We suggested eating lunch as soon as we got there. The tour said that lunch was it included, but there was a bit of confusion with our driver. We embarrassingly had to remind him that it was included in the tour, asked him to pay for our lunch and he apologized for the confusion. We later left for Pisa and it took about 2 hours. We spent a bit of time touring both the cathedral and dome and he did not rush us at all, although we were on our own. The drive home was about 3 hours long and exhausting to say the least. He was considerate in taking bathroom breaks on the way there and back from Florence. Would recommend having a good night sleep before the trip. On the day of make sure that you bring snacks and drinks as this is a long drive. This trip was a scam! They advertised/described this as a semi-private/small group tour with a maximum number of people in the tour. There were over 30 of us in a bus and we had to rush through the entire tour. Although the tour guide Vittoria was nice and pleasant, I did not pay a lot of money for a huge tour. I paid for a semi private tour. When i complained to Viator, i was told that I should have backed out of the tour when I saw the size of the group! Do not sign up for this overpriced tour if you want a smalller tour group! You will be sorry! We had a great trip with Vittoria. She was incredibly knowledgeable and we learned so much about the history of Florence. Although it rained all day it still was a worthwhile visit. Pisa was wonderful and again, Vittoria knew so much and was able to explain the area very well.This excursion is well worth the cost. The drive is long and it is a long day, but seeing the sights of Florence and Pisa was well worth the drive. I would highly recommend this tour for those who are in Rome and cannot afford to spend 3 days in Florence and Pisa. A long day but the trade was well worth it for what we learned about the two locations. The only thing i would change was fo rate guide t provide some other insights to Florence that we found other people we met had been shown. This was an amazing trip. Florence was beautiful and the tour guide took us around and explained all the various sights along the way. There was plenty of time for pictures. The tower of Pisa was phenomenal. There was lots of time for some great pictures!! The lunch was fantastic. Our family of 4 is all vegetarian and they went out of their way to ensure we got a great meal too. We also squeezed in some shopping at the leather market next door which wasn't quite part of the tour. Very flexible tour guide and good value for your money. If you are traveling with your family to Rome with very limited time and wish to see other parts of Italy's history, I definitely recommend this tour. Didn't have any time to explore Florence. No art and no museums. Got to Pisa late it was ok but would have liked to see it in daylight. Thought lunch was included, but we paid for it. The tour is great for people who have some prior knowledge of Florence and Pisa, but is otherwise boring for those who don't. The reason the tour takes so long is primarily due to the distance between Rome and Florence, but if there is no prior knowledge of Florence, you are better off just going to Pisa by itself.